Although not a native of Great Britain, this beautiful species has been widely distributed to waters of varying types throughout the country. 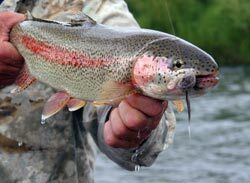 The distinguishing feature of the Rainbow trout is the pale crimson band running along the lateral line from tail to head; the sides are generally silvery, shot with pink iridescence and shading off imperceptibly to a pale olive on the back and to white on the underside; the whole back, sides, and upper fins are thickly studded with small black dots, the lower fins being pale orange frequently margined with white. In the young stages of the fish the parr marks of a bluish purple are very apparent. Their capacity for food is extraordinary and where they can obtain an unlimited supply their growth rate is very rapid; it is quite possible, for instance, for Rainbows to attain a weight of half a pound in their first year, and from one and a half pounds in their second year and these weights have much exceeded in a few cases. Although quite at home in the most rapid waters, a running stream is by no means necessary to their well being and Rainbows will thrive well in ponds and small lakes where the only water supply was from surface drainage. Their food does not differ materially from that of the Brown Trout; they show a marked preference for surface food and spend much of their time in sluggish waters in cruising about the surface in search of it, seldom remaining for long in one position like Brown Trout. As a sporting fish for angling purposes we have every confidence in recommending the Rainbow trout for waters that are unsuitable for stocking with Brown Trout and there are few ponds and lakes having fairly pure water where they could not be introduced with almost certain success. Note: The Rainbow Trout section was written in 1889 by A. R. Peart, Pisciculturist and Engineer, the first proprietor of Berkshire Trout Farm. His words written over a century ago are as valid today as they were then.